Home » Campaigns and Policy » Comment and media » Austerity policies have created a “human catastrophe” – UN Committee Chair condemns the UK’s record on human rights. Austerity policies have created a “human catastrophe” – UN Committee Chair condemns the UK’s record on human rights. 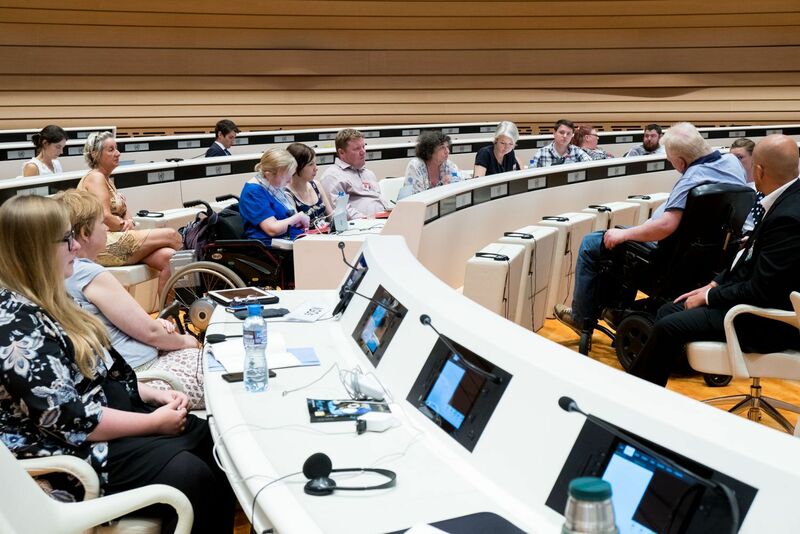 Deaf and Disabled People’s Organisations welcome the public unity of the UN Committee on the Rights of Persons with Disabilities in their clear criticism of the UK Government’s ‘grave and systematic violations’ of disabled people’s human rights. The Committee condemned the UK’s attempts to misrepresent the impact of policies through unanswered questions, misused statistics and a smoke screen of statements on policies and legislation which fail to implement the rights of disabled people in reality. A coordinated approach to implementing the Convention and the Committee’s recommendations across the UK, with fully resourced and meaningful involvement of disabled people. Devolved Nations also had the opportunity to address questions put to them by the Committee. Deaf and Disabled People’s Organisations across the UK have worked in coproduction to collect evidence and compile the reports and presentations through the Review process. The DDPOs submission was co-produced by Disability Rights UK, Inclusion Scotland, Disability Wales, Disability Action Northern Ireland, and the Reclaiming our Futures Alliance. Additional submissions with more information about the devolved nations were also submitted by DRUK / Disability Wales / ROFA; Inclusion Scotland; and Disability Action NI. The UN Committee on the Rights of Disabled People Examination assessed what steps the UK and devolved Governments have taken to implement the UN Convention on the Rights of Disabled People following ratification of it in 2009. The Committee is a body of experts, nominated and elected by governments, the majority of whom are disabled people. They will publish their Concluding Observations next week. The committee postponed its assessment of the UK (originally due in 2015) to investigate a complaint of the violation of disabled people’s rights as a result of welfare reform. This was brought under the optional protocol of the Convention. The findings expressed concern of grave and systemic violations of disabled people’s human rights. That investigation looked only at a part of the UN Convention on the Rights of Disabled People – with a particular focus on the impact of austerity measures and welfare reform. The current review has investigated all of the Articles within the Convention. Inclusion London and other UK Deaf and Disabled People’s Organisations were recently in Parliament to launch our latest report to the United Nations disability committee.